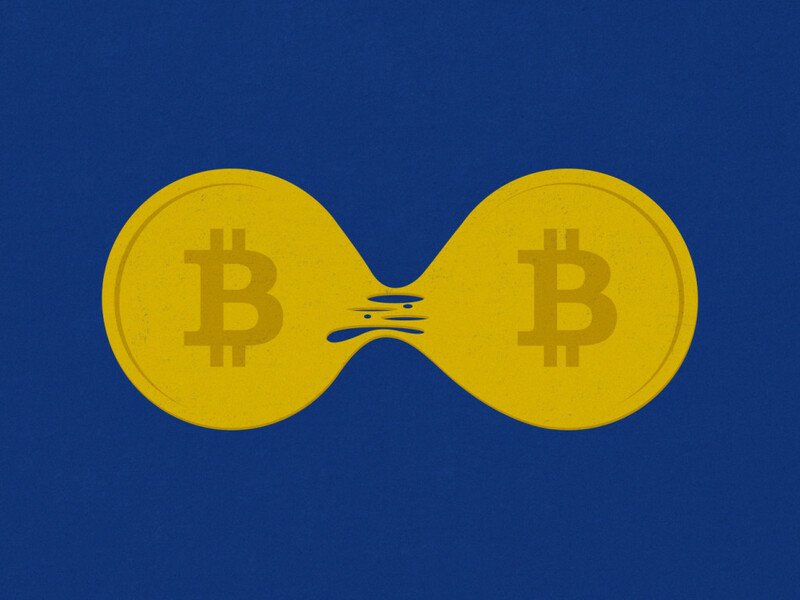 The bitcoin community can’t even agree on whether it’s breaking up. “When parts of the community are viciously turning on the people that have introduced millions of users to the currency, you know things have got really crazy,” he said, referring bitcoin company Coinbase being banned from the bitcoin website and removed from discussion groups. He also complained of denial-of-service attacks against Coinbase and others, while The New York Times reported that some developers had received death threats. Anderson has self-serving reasons for saying this. He runs one of the world’s largest bitcoin exchanges, a place where you can trade all sorts of fiat currencies for the digital currency. He definitely doesn’t want anyone thinking bitcoin has failed. On Wednesday, he and his company called reporters to Coinbase’s HQ just to spread that message. But he raises a good point—denial-of-service attacks and death threats not withstanding. Bitcoin is designed to operate as a democracy, and indeed, it’s deep into a major election. This is pretty much how things are supposed to work. Sure, the project needs a better governance structure, and the election tactics got out of hand at times. But, well, this is the internet. When a technology is still maturing, these things happen. People forget that when the internet itself first entered the mainstream, it was the wild west too. The rub is that Anderson’s camp believes that if it loses the election, the bitcoin network will gradually slow to a crawl. Or, in Hearn’s words, it will collapse. At issue is the size of the “blocks” that identify transactions on the network. Anderson and those who agree with him argue that the community must increase the block size to accommodate the increasingly large number of transactions on the network. “Assuming that transaction volume keeps going up, transactions will get increasingly unreliable at random times. That’s just not a good situation,” says Gavin Andresen, an independent software developer who is also part of this camp and appeared via video at Coinbase’s event to make the same case. In other words, if the block size doesn’t increase, they say, bitcoin is screwed. As Anderson points out, the bitcoin network currently does about seven transactions per second. PayPal does 100. And Visa does 4,000. “Bitcoin is going to have to continue to scale,” he says. The result of the election won’t have an immediate impact on individuals who use bitcoin today—let alone the average consumer, who has yet to embrace the digital currency. But it could impact the long-term future of bitcoin, a technology that promises to significantly reinvent how we deal with money. The hope is that this vast network of machines will let us move money from place to place as easily as we send texts and emails. As it stands, few people actually hold the bitcoin digital currency and use it to buy stuff. Overstock.com, the largest online retailer to adopt bitcoin, says it accounts for less than 0.1 percent of sales. But even if the average consumer never adopts the currency, bitcoin remains enormously important. It can serve as an open and inexpensive way for businesses and banks and other organizations to move money behind the scenes. It’s like a Visa payment network that’s not controlled by Visa, but by the people—one that is open to all and that can money more cheaply and efficiently. That’s something we should all care about. The bitcoin network is driven by what are called miners, specialized computers that run the bitcoin software. In exchange, the people who run these miners are automatically paid in bitcoin. That’s their immediate incentive. But they also have an interest in expanding the network and keeping it running smoothly. Otherwise, those payments will dry up. In this big election, they must weigh both of those incentives. What people like Anderson and Andresen are trying to do is change the software that runs all those miners, so that bitcoin can accommodate a larger block size. They believe this is the best way to ensure the health of the network. But others are intent on maintaining the status quo—some because of ideology, others because of money. Some people don’t want bitcoin to stray from its original mission and fall into the hands of big businesses. Others think there are better ways of accommodating more transactions per second. And, it seems, certain miners are worried their bitcoin payments will drop if they make a switch. Could Anderson and crew lose this election? Well, they already lost once. That’s part of the reason Hearn quit. Last summer, together with Andresen, Hearn proposed new software called Bitcoin XT that would increase the block size. And the community rejected it. Now, Andresen and others are proposing much the same thing with something called Bitcoin Classic. Why do they think things will go better this time? They’re not trying to raise the block size quite so high as they did with Bitcoin XT. They’re proposing a one megabyte increase, not several megabytes. And that’s significant—mostly because of the Great Firewall of China. Gavin Andresen and others released the official version of Bitcoin Classic on Wednesday morning, and Coinbase was among those who loaded the code onto its miners. Now, we’ll have to wait to see if the rest of the miner community adopts it. Basically, 75 percent of all miners must adopt Bitcoin Classic for the larger block size to take effect. If that threshold is reached, all other miners will have a month to adopt the new block size. If they don’t, they will indeed split from the larger whole—at least in part. People like Anderson and Andresen don’t think a real split will happen. If the network switches to the larger block size, they say, minors who stick to the smaller size will see the value of their bitcoin payments drop. This is basically because they won’t have as many others backing their transactions. “The economic incentives are there for the blockchain to align on one version,” Anderson says. In other words, he thinks everything will work out just fine, and the bitcoin network will accommodate an ever increasing number of transactions. That said, others view the situation a bit differently. For Jeff Garzik, another longtime bitcoin developer in the same camp as Anderson and Andresen, the smaller block size increase proposed by Bitcoin Classic could be more palatable to Chinese miners. One of the chief issues with Chinese miners, as Hearn pointed out, is that they’re behind China’s Great Firewall—the system that filters Internet content according to the dictates of the local government. This means Chinese miners can’t communicate with the rest of the Internet as quickly as other miners, and if the block size is increased too much, things will slow down even more. In certain situations, they could mean they lose out on bitcoin payments. Yes, even if Bitcoin Classic is adopted, its two megabyte block size will eventually become a problem too, as the network continues to expand. Then we’ll need another increase, say Anderson and Andresen. And that could mean that China becomes a bottleneck once again. But Garzick says the power structure of the miners is always shifting. Though China controls a majority of the mining power today, that may not be the case in the future. Chinese miners always will be at a disadvantage because of the Firewall. But situations where block size can effect their money-making prospects are relatively are. And they will have other incentives to move with the rest of the community. It’s not a bad analogy. Yes, sometimes we elect people who end up doing more harm than good. That very well could happen with the current election. But then along comes another.